[Lib] ImageMessage (v2.1)- Send images to players via the chat! Discussion in 'Resources' started by bobacadodl, Dec 10, 2013. Send images to players via the chat bar! * If you want more accurate colors, only use images with color codes from http://minecraft.gamepedia.com/Formatting_codes Here's a <Edit by Moderator: Redacted mediafire url> palette[/url]. justin_393, ChipDev, GrandmaJam and 43 others like this. This looks really good. Good job. the things you can do with bukkit just keep expanding! Nice job dude! This is amazing! Just had a thought. Would it be possible to do this in the lore of an item? Thanks. Apparently theres no method getResource? any ideas? bobacadodl This is beautiful. You are a boss. bobacadodl Can we expend the max size ? GrandmaJam and Skyost like this. 2) Is it possible to use RGB Colors, not only the Minecraft Colours? No, this is a known issue . 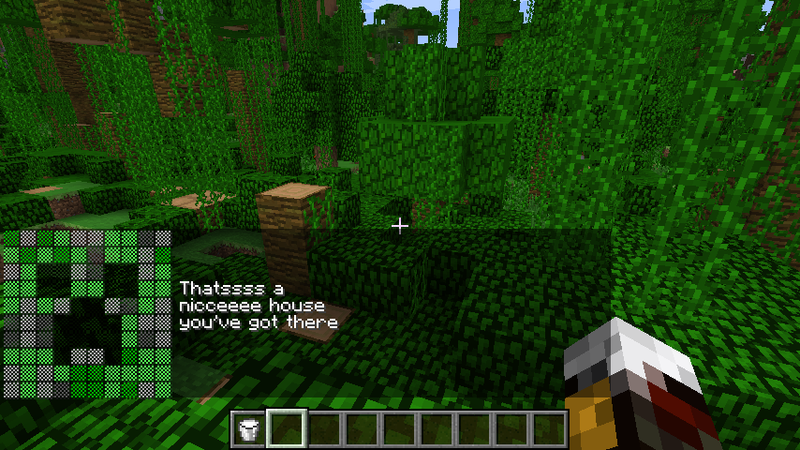 The messages in the chat can only use minecraft ChatColors, so it rounds each color to the closest chatcolor. If you want more accurate results, use images made up of the chatcolors. DSH105 and bobacadodl like this. Haven't tested that, but it looks like it will center the text on the page. Is that correct? Thanks for this great asset though! Also the inaccurate colors is a known issue. I'm looking for a better method for color matching. bobacadodl wow, totally missed that. Stupid me. And sounds good! Also, I have no experience with java images/color of any kind, but would adding more contrast before you check the colors return a stronger match to the minecraft colors? If so, that would probably be a simple solution to the issue. bobacadodl Great, hope it works! This would be an awesome addition to my plugin. When a user scores, show the huge head and say CCRAMA SCORED! You will get errors trying to get a web image without this change. Bukkit ruined my formatting/tabs. Please ignore the horrible formatting! Known issue: This library often results in the images having lots of grays. This is because grays are "in between" lots of colors and the current algorithm rounds to the closest color. If you can come up with a better color rounding algorithm, let me know! Nice, I'll try it out! Updated the post with the new algorithm! It works better for some images, but worse for others . Overall, I'd still say its better, so I've switched.